Take a trip to the neighboring island of Anguilla, home to celebrity guests and pristine beaches, on this sightseeing cruise from St Maarten. Sip mimosas and listen to island beats as your cruiser travels to Shoals Bay, where you can disembark and spend free time exploring the sandy beach. Eat lunch, including an indulgent ice cream dessert, on the boat and take the opportunity to shop for souvenirs with some of the beachside vendors. Make your way to the A.C. Wathey pier on St Maarten, where you will board your 'water taxi' bound for Anguilla. Admire the tropical scenery gliding by during the 45-minute journey. Sip mimosas and enjoy the island beats as you pass Fort William in Little Bay; snap photos of the eastern coast of St Maarten. 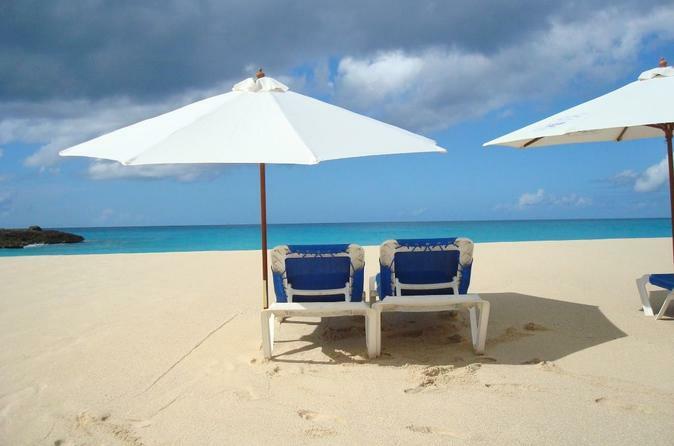 Arrive at Anguilla's Shoals Bay, home to celebrities and pristine sandy beaches. Dive off the boat for some swimming in the aquamarine waters or go ashore to explore. Refuel with a hearty lunch, including an ice cream dessert, while the boat is docked. Take the opportunity to purchase souvenirs from the beachside vendors before returning to St Maarten.